(DESTIN, Fla.) January 23, 2017 – One in 10 high school students has been hit, slapped or physically hurt by a boyfriend or girlfriend. As we recognize Teen Dating Violence Awareness Month in February, Shelter House and Project Respect present a fun new event that will teach local teens about healthy relationships and warning signs for unsafe relationships. Quest 4 Respect is a social media scavenger hunt starting at 6 p.m. on Friday, February 3 at Destin Commons. Cards with clues will take teens on an Instagram scavenger hunt throughout the shopping center where they will snap pictures for a chance to win prizes. Teens that finish the scavenger hunt will be entered to win a big prize pack with numerous items donated by Destin Commons restaurants and retailers. The party continues until 8 p.m. with DJ 30A, a photo booth, glow sticks and more. 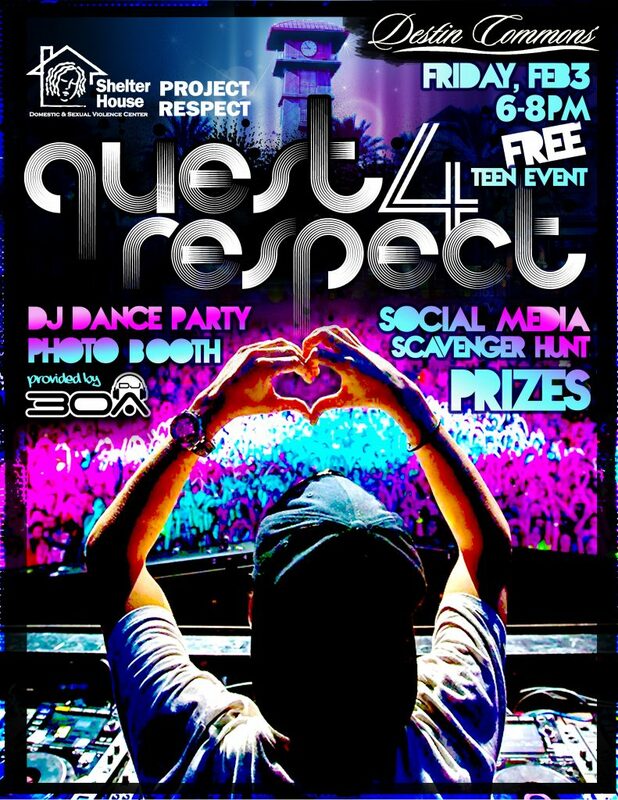 Quest 4 Respect is a free event for all teens. Pre-registration is not required. More information can be found on the Project Respect Facebook page at www.facebook.com/ProjectRespectOW.